Some of you might have thought yesterday's post were already my contribution to the July's theme day "empty", it was not. An empty beach would have been so obvious, easy, though, but not creative. 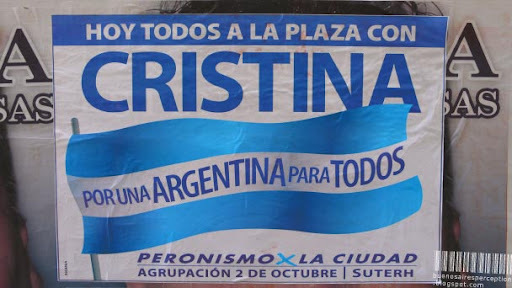 My interpretation of "empty" is an old campaign poster for Cristina Kirchner calling for a march toward Plaza de Mayo. "For an Argentina for all" The slogan sounds really great and worthwhile but it is nothing more than a shallow, empty promise. Politicians in general, tend to come out with a lot of empty speeches with even more empty words. They promise you everything until they get (re)elected, and the very next day they don't give a hoot about you. I really wonder who buys these hollow phrases anymore. In Cristina's case, the legislative elections last Sunday have put an end to her style of politics. Thanks for that! You could be talking about any of the 20 or so countries where I lived so far. Seems to be a universal thing. Emptyness. Indeed. Ditto here ... empty phrases which the people buy each and every time ... need to wake up to ourselves and call them to account ... good and useful post! Very creative post and I think you'll find a lot of people agreeing with you because politicos need to promise the sky when they know they can't even deliver the s**t! But they say voters get the politicians the deserve. We want to hear them promise a united country. Who needs politicians, 'que se vayan todos'. Perfect and powerful for this theme day! Politicians serve only themselves. They feel a sense of entitlement and permanence. Look no further than Iran. We face the same situation here but are too "preoccupied" to really vote them all out of office;all of them! Excellent "empty" photo/explanation! We can all relate to it. This is a great interpretation on the theme and I can't agree more with your statement regarding empty promisses! I'm so fed up with politicians!! !